One of my favourite fairy-tale retellings! 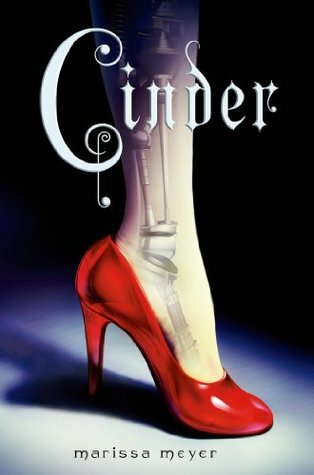 A spin-off from the original Cinderella, Cinder tells the story of a cyborg girl in New Beijing. Prince Charming? Check. Evil Stepmother? Check. Ugly Stepsisters? Check. Well, one of them is. Blending Fantasy and Sci-Fi together, Marissa Meyer creates a world where nothing is as it seems. Cinder is a very interesting character because 1. she's a cyborg and 2. she's a mechanic. How many mechanics do you read about these days? Skilled at her job, she does her best to survive in her harsh family and tries her hardest to find a way to leave. Things seem fine right? Until her sister Peony catches the deadly disease (letumosis) and eventually dies. Cinder is sent off to be a test subject, where she finds out that not only is she immune to letumosis, she is also not who she thought she was. Throughout the book, we can see that Cinder is a strong-willed character who doesn't really care for anything but the greater good. Her character develops slowly: from naive mechanic to brave, strong girl. At the end, we see Cinder determined to find a way out of this mess. I'm glad that she didn't decide to roll over and give up. Many people in her shoes would've done so. I mean, being kept custody by Lunars? I bet their security is at level 9000. Cinder is a great book perfect for those who love fairy-tale retellings. Who could ask for more? I couldn't agree more with this! I loved Cinder, both book and character. This was one of the first books I've ever read and loved about a cyborg, mechanic, and "alien." The author really outdid herself with this world! I loved the part about Lunar security being at level 9000 ;) Intense security indeed!